Siemens appliances are number 1 on the German home appliance market and the leading brand in the world. The future is moving fastly forward with new innovations and Siemens are right there in the front of the que. Their new connect app appliance range are the future for your home, helping you control your chores so you have more time to spend with family and friends. They are creating new technologies such as iSensoric which is hidden inside the Siemens appliances and introducing Zeolith drying along with energy efficiency, and keeping the appliances sleek and stylish in design. Siemens have built the varioSpeed technology into their cooking appliances so you can cook your food twice as quick as a general fan oven. Perfect for your busy family life juggling work and home time. iQ700 ovens come with TFT Touchdisplay Plus so you can find the programme you need at the touch of the screen. Other features include activeClean, who has time to scrub their oven clean, let it do it itself! BakingSensor can detect moisture in your food and when done will turn off so you will not over cook your cakes or your roast chicken. Along with this you can use the roasting Sensor Plus which has three measuring points and is able to accurately take the core temperature of any of your dishes. It can be used with the pulseSteam and microwave settings. There are a variety of ovens for your kitchen with the double oven, microwave, steam oven and the combination oven all that are of the highest quality and design. Along side these Siemens have developed the perfectly framed hobs that come in a variety of fuels. They are slim in design and tough with scratch resistant surfaces. All the hobs are finished to a professional look so will look fantastic in your Siemens kitchen. To finish off the cooking appliance look the Siemens Hoods come in a variety of designs and banish all unwanted smells, grease, and steam. The climateControl technology detects the levels of steam and react to get rid of them quickly keeping your kitchen clean and fresh. Siemens have introduced iQdrive motors into their hoods that are energy efficient and extremely powerful but are quiet perfect for your family home. They also provide a 10-year motor guarantee and a 5-year parts and labour guarantee, so you can be safe in the knowledge that your hood is built to last. Siemens have introduced Wi-Fi enabled appliances so you can control your washing machine whilst at the childminders, turn your oven on whilst in a business meeting, check whats in your fridge whilst out shopping, all controlled via the app on your mobile. Welcome to the new age of technology! Siemens Dishwashers also have the fantastic iSensoric technology as well as Zeolith drying. Zeolith is a natural mineral that absorbs moisture and converts it to heat, so your dishes are always dry when the programme has finished. Because of the Zoliath not needing to use additional energy to heat it is more energy cost effective, saving you money in the long run. Siemens iSensoric technology sensors control and calculate the auto programmes at a push of a button. It automatically adapts the amount of water needed based on the cloudiness of the water once its switched on. It will control the washing and drying process making sure every wash is perfectly cleaned and dryed so you do not need to do any work but load and unload the appliance! The iSensoric technology controls the aquaStop that safely prevents any water damage this is detected by the security sensors that alerts the aquaStop into action. Siemens guarantee this for a lifelong warranty. 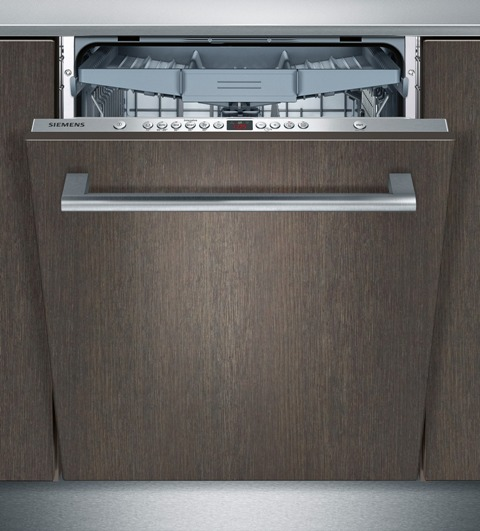 There are many features to the Siemens dishwashers which we can go through with you and show you how Siemens have brought their Dishwashers into the 20th century. Fresher food for longer with iSensoric technology! freshSense sensors control the temperature of your cooling appliances which is controlled by the iSensoric technology. Even if your appliance is in direct sunlight the freshSense sensor will keep your food at the right temperature so nothing is spoilt and is fresher for longer. NoFrost technology also controlled by iSensoric technology is ideal in this rushed world we live in, who has time to defrost a fridge freezer taking hours for the ice to melt and then all the hassle of drying it up after. NoFrost technology does it all for you by an air-circulation system that controls the humidity to the outside of the cooling appliance. Sensors measure the humidity in the appliance and automatically defrost periodically so no build up of ice ever develops. Each of the cooling appliances are streamlined and elegant, they will look stunning in your kitchen but not only the outside but the inside is impressive also with the LED lighting illuminating your foods, the easyLift door shelves that fold down for your convenience, additional storage areas and not forgetting the bigBox, plenty of room for those stacked pizzas! iSensoric technology is a new innovative network of sensors built into your washing machine. It controls the I-Dos system which automatically doses your detergent into your washing. The I-Dos automatically determines how much is needed for each wash depending on weight and the programme you use. So as it uses exactly what you need in every wash your clothes are perfectly cleaned every time and energy efficient saving you energy costs. Siemens sensoFresh system is perfect for getting rid of those smokey smells or kitchen odours or even to refresh the clothes you’ve had in the back of your wardrobe since the last season change. It uses active oxygen that is powered by iSensoric technology. It is a 30-45 min run without using detergent and water. It traps the odours as the clothes circulate the drum and are perfect for your sensitive clothes that need that extra special treatment. Finally, you can be safe in the knowledge that everyday the clothes you are wearing are fresh and clean with confidence.